Travis Wilson folded down the back seats, stuffed the surfboard-sized check into his Chevy Equinox and began the three-hour drive north to Rhinelander. It was unseasonably warm that late June day, especially for the northern reaches of Wisconsin. Eighty-one degrees -- with the temperature soaring higher inside the oven-like Rhinelander High School gymnasium. It was so hot that Laura Ritchie, Wilson’s Wisconsin Sports Network colleague, feared for the safety of another member of that day’s traveling party. Ritchie has been around high school sports, and mascots, long enough to know that it can get oppressively hot inside those poorly ventilated, fur-covered suits. As the ceremonies inside the steamy gymnasium stretched on, she wondered if this could be the end for Frank the Buffalo, the “face” of Frontier Communications. “I was thinking, ‘Oh my gosh, our Buffalo is going to pass out,’ ” said Ritchie, WSN’s vice president. From left to right: Frank the Buffalo, Frontier Communications' Steven Jones, WSN's Travis Wilson, Hodag, Rhinelander athletic director Brian Paulson. Turns out Ritchie’s fears were unfounded. The check presentation ceremony went off without incident. 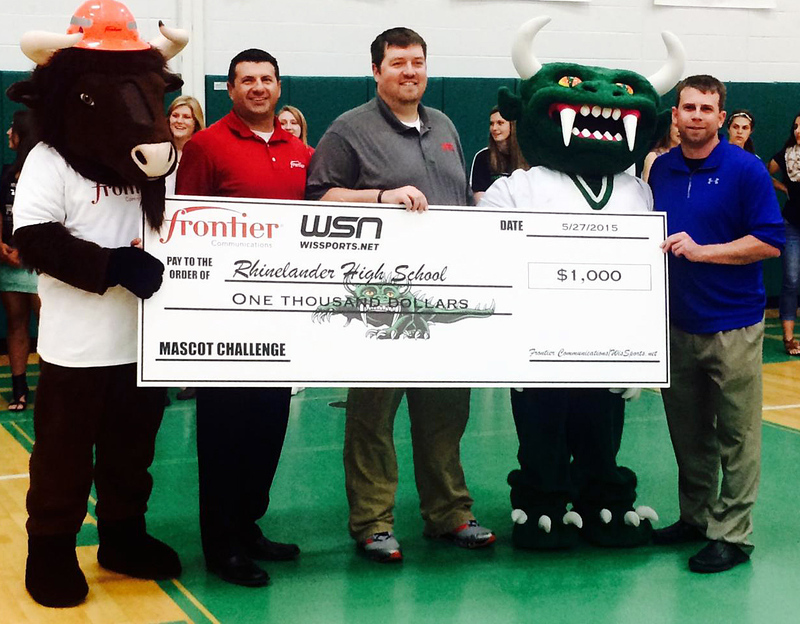 Rhinelander High School received it’s $1,000 for winning last spring’s WSN Mascot Challenge, and the photo op included a picture of Wilson, WSN’s general manager, presenting the oversized check to Rhinelander High’s athletic director Brian Paulson and Hodag, the school’s mascot. Frank the Buffalo also appears in the photo, standing tall and looking none the worse for wear. As for the Hodag, that was Ritchie and Wilson’s first in-person brush with one of Wisconsin’s most unique and popular mascots. It topped Hortonville’s Polar Bears with 23,400 votes to 19,133 in the Mascot Challenge’s finals poll. Speaking of mythological beasts, a high school website with the longevity and profitability of WSN might just be as rare as a Hodag. The Wisconsin Sports Network, or WisSports as it is commonly called, was founded in 2002 by Nick Kartos and, after several changes in ownership, tweaks to its content and additions to its staff over the years, is more entrenched than ever on the Wisconsin high school sports scene. Wilson said WSN’s traffic consistently hovers around 35 to 40 million pageviews per year, and memberships to the site’s premium content are steadily on the rise. In back-to-back weeks this summer, the site set new single-week WSN Extra subscription revenue records. WSN boys' basketball editor Mark Miller has been covering Wisconsin hoops for more than 25 years, and he was was inducted into the Wisconsin Basketball Coaches Association Hall of Fame last year. Miller and girls' basketball editor Norbert Durst, hired in 2012, join Wilson, who also serves as football editor, in giving WSN a trio of sport-specific experts producing one-of-a-kind content. All three routinely make television appearances and serve as guests on regional radio shows. Wilson also has helped keep WSN relevant by emphasizing a strong social media presence and spearheading a recent mobile-responsive redesign of the site. 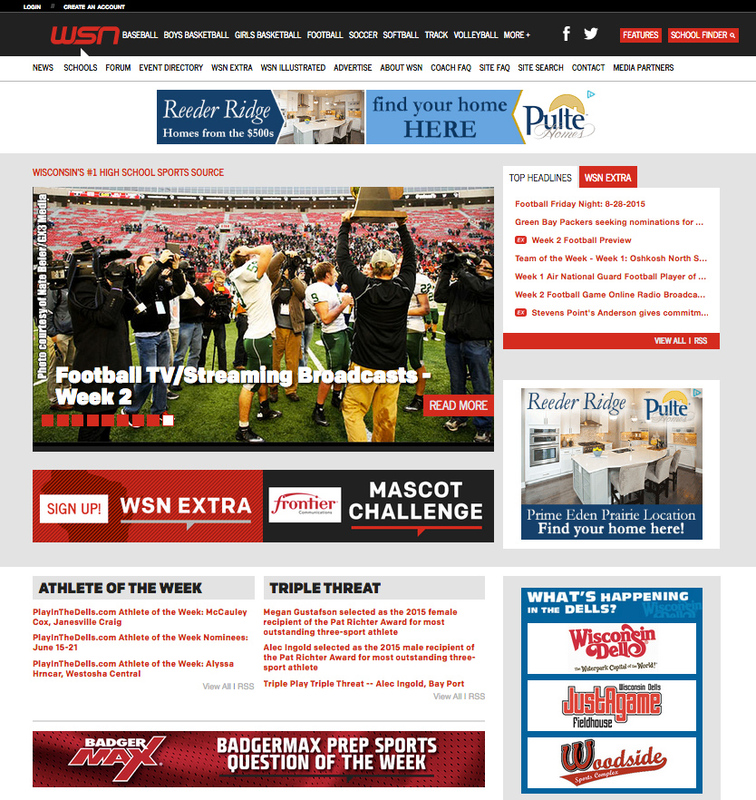 WSN’s staying power is an anomaly in the world of statewide and even regional and national high school sports websites. While many states have sport-specific blogs and message boards, their lifespans often are short. Young, gung-ho bloggers and corporate-backed operations alike have been drained of their enthusiasm, not to mention significant amounts of cash, after realizing it can take years of long hours and endless work to build an audience large enough to ensure profitability. "We have seen so many of these sites come and go over the years," said Tim Kolehmainen, a sports journalist who has covered high school sports for more than two decades. "Somebody starts one up they have a lot of energy in the beginning, they put a lot of time into it, and then it fizzles within the first year or two." VarsityOnline.com covered high school sports in Wisconsin and throughout the country, but its brief run as a go-to national resource ended in the early 2000s as the dot-com bubble burst. More recently, iHigh.com, another site covering high school sports in Wisconsin and nationally, abruptly shut down as its parent company, Volar Video Network, ceased operations. On a smaller, statewide scale, West Bend-based PrepsOnTheNet.com, a video-heavy site covering Wisconsin high school sports, folded in 2011 after a brief run of producing mostly highlight packages and postgame interviews. Kolehmainen worked for VarsityOnline while living in Minnesota in the late 1990s and remembers being stunned by the rapid growth of the operation. "It was a wide net they were trying to cast," he said. "I don't know how many states they were in during its heyday, at least 40 states. We were fielding calls from Arizona softball. "Trying to figure out how to make it work financially is always the big problem." Kolehmainen covered high school sports for newspapers in Minnesota and Connecticut after leaving VarsityOnline and before joining Breakdown Sports USA. As the the president of Breakdown Sports Media, he oversees the production of preseason yearbooks devoted to several high school sports in Minnesota. "I know of different sites that do one sport well," said Kolehmainen, who has provided content for several Minnesota high school sites. "As far as covering a wide range of sports in a given region, (WSN) might be the best. They seem to have a pretty good model." National sites such as Rivals.com, Scout.com, 247Sports.com and ESPN all cover the top basketball and football players in Wisconsin. They put that recruiting content behind paywalls and offer subscription plans, just like WSN. “We’re competing directly with those sites on some of those (recruiting) stories and for some of those scoops,” Wilson said. Wilson added that while the national sites focus on only a handful of the top athletes, WSN's coverage extends to hundreds more Wisconsin high school athletes who will head to other Division I, Division II and the many outstanding Division III programs in the state, plus players who will see their athletic careers end at the high school level. Those national sites also pay little attention to secondary sports (WSN devotes sections of its site to soccer, volleyball, baseball, softball and track, among other sports) and can’t match WSN’s comprehensive offerings of game stories, statistics, schedules and scores. Other, niche sites have gained traction among coaches in recent years because of their stat-tracking applications or video-editing capabilities. And, despite perpetually shrinking staffs, local newspapers still cover their area high school teams heavily. Wilson, who grew up about 60 miles northwest of Madison in Richland Center and lives in nearby Reedsburg, said he doesn’t see newspaper sites as competitors. He said WSN’s most popular stories typically are those that have some sort of voting mechanism, mention multiple teams and players and have a statewide interest. WSN provides access to its database to the Milwaukee Journal Sentinel, which in turn enters statistics from its area teams. Schedules, stats and standings from WSN appear on the Journal Sentinel site and can be sorted by region (the Journal Sentinel stat pages default to the Greater Milwaukee region). Despite a constantly shifting lineup of competitors, there’s no question WSN remains Wisconsin’s preeminent high school site. WSN has more than 20,000 Facebook likes and 9,000 Twitter followers. By comparison, the Journal Sentinel and Madison-based Wisconsin State Journal, the state’s two largest newspapers, have 1,281 and 2,801 Twitter followers, respectively, for their high school sports sites. The Journal Sentinel’s Prep Plus Facebook page has 445 Facebook likes. Popular as it is, not even WSN can survive solely on the money it makes on national ad network impressions generated from its bustling traffic. Subscriptions to exclusive content account for another large chunk of income, as does the direct advertising partnerships (such as the one with Frontier Communications) secured by Ritchie. “We wouldn’t have a site if we didn’t have those direct sales,” Wilson said. Ritchie, who played on the varsity girls’ tennis team at Portage High School and was a No. 1 singles and doubles player at the University of Wisconsin-Stevens Point, said she’s had success selling to local business (ads can be placed on specific school or team pages) and to national entities such as branches of the U.S. military and fast-food chains. Usually, though, she “shoots for the middle” by focusing on regional organizations that have local branches sprinkled throughout Wisconsin. Health care providers and telecommunications companies are examples of Ritchie’s target-zone advertisers because, in part, she can offer the ability for those companies to handpick the communities that are most relevant to them. There’s no doubt Ritchie’s unabashed passion for Wisconsin high school sports contributes to her sales acumen. She wrote on WSN how her favorite memories from high school were going with her dad to pick up the local paper on mornings after a tennis match and checking to see if she was mentioned in the story. These days, thousands of parents and athletes go to WSN for their postgame info, often accessing stats and stories on their mobile devices just minutes after the final whistle. Wilson said WSN typically gets about 300,000 to 350,000 pageviews on the final Friday of the football regular season. Hansen, a self-described sports junkie, said he scans WSN to check schedules and statistics for opposing teams during girls' basketball season. He said he even surfs the site to stay informed on other sports, such as football and boys’ basketball. “I’m a stats geek, so I love looking at boxscores and things like that,” Hansen said. “When I was growing up some of that information used to be in the newspaper. But you couldn’t always get the scores from all over the state, and you especially couldn’t get all the boxscores. Eau Claire Leader-Telegram sports editor Joe Ziemer said he doesn’t see WSN as a competitor. Rather, he said, the site serves as a complementary statewide resource to the west-central Wisconsin-based high school coverage produced by the Leader-Telegram. “They are synonymous with high school sports in Wisconsin,” Ziemer, who also covers the Leader-Telegram’s boys’ basketball beat, said about WSN. “Miller has done such a good job of raising the profile of high school basketball players in the state. It’s a great resource for me, for coaches and for fans. While regional high school sports sites are common, few states can boast anything comparable to WSN's comprehensive coverage, from Ashland to Whitewater, of the 507 high schools that are Wisconsin Interscholastic Athletic Association members. The Minneapolis-based Star Tribune features a network of high school sports sites, named Hubs, that are geared for a statewide audience. The Minnesota Hockey Hub, which covers boys’ high school hockey, attracts about 10 million pageviews per year alone. But the Hub sites, which, like WSN, are powered by Sport Ngin technology, have only existed for five years and don’t offer message boards or paywalled recruiting coverage. The St. Louis Post-Dispatch for years has used custom-built database technology to generate schedules, scores and standings on its stlhighschoolsports.com site. That technology, going back to the days of 8-inch floppy disks, has been used to create statistical data to accompany high school coverage in the St. Louis area for more than three decades. But, in comparison to WSN, the geographical range of the coverage is much smaller, there isn’t the same depth of recruiting coverage (the site has no paywalls) and there are no message boards. WSN has school pages that include basic information such as nickname, address, colors and song. The pages also have the school’s enrollment numbers going back to 2003 as well as links to all of its team pages. Team pages show records, statistical leaders, standings and team-related news stories. Player pages typically have height and weight information along with jersey numbers, graduation years and game-by-game, season and career stats. Coaches, statisticians and team managers have access to team pages and the ability to enter and modify schedule, roster and statistical information. Wilson estimates about 78 to 80 percent of WSN’s football statistics are entered by team representatives. He said teams enter about 60 percent of the site’s basketball stats. Several conferences mandate teams to enter statistics on the site in order to be eligible for postseason awards. Hansen said he typically has a statistician call in basic stats (points, free throws, 3-pointers) immediately after a game, then fills in the rest of the information (assists, rebounds, steals and turnovers) within a day or two. Kartos, who later served as the director of advertising for Sport Ngin, played basketball and golf at North Fond du Lac High School. A year after graduating from the University of Wisconsin, Kartos was working in Information Technology as analyst for a large corporation and looking for a way to build his portfolio as a web developer. An avid basketball fan, he enjoyed reading Miller’s Wisconsin Basketball Yearbook and was a regular on D3Hoops.com and its popular message board. Kartos decided to offer information similar to Miller’s yearbook, only update it constantly online throughout the year. He also included a message board that would allow high school hoops fans to interact. The site, initially called WisHoops.net, had 7 million pageviews in its first year, Kartos said. Kartos quit his IT position and borrowed money from his family with the intent of making WisHoops his full-time job. In 2003 the site was acquired by When We Were Young Productions, the start of an odyssey that would include multiple ownership changes, a rebranding to Wisconsin Sports Network and the addition of Miller, Ritchie, Wilson and Durst to the full-time staff. Sport Ngin bought the Wisconsin Sports Network from TDS Telecom in 2012. WSN’s finance and human resources services are handled by Sports Ngin staff, as is much of the site’s statistics entry. That still leaves the bulk of the work in the hands of WSN's four full-timers. “You get varying responses when people talk about who runs the site,” Wilson said. “You get some people that think we do it out of our mom’s basement in our free time. You get others that think we have 20 or 30 or 50 full-time employees.